The temple performs four aartis for Baba at 6:30 am, 12:00 noon, 6:30 pm and 8:30 pm. The four aartis represent prayers offered to Baba during the four major kaalas or time of the day - pratah kaal or morning, madhyan or noon, sandhya or evening and raatri or night. 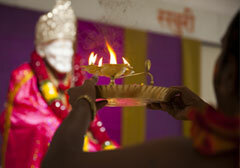 Kakad aarti signifies waking Baba at dawn and getting him ready for the day. The process starts at 6:15 am with the curtains opening and the gentle rendition of Utha Utha Sakal Janaa. After Om Jai Jagadisha Hare, an offering of milk, butter and sugar is made. The kakad aarti now starts around 6:30 am with waving the Pancharati to Baba. Compositions by Baba’s devoted Bhaktas are sung in Marati language. At the end of this phase, the Pancharati after invoking baba’s blessings is offered to the devotees. In the next phase, Baba is given a abhishekam or shower to the rendition of Purusha suktam and decorated for the day. After the abhishekam, Vishnu Sahasranamam, 108 names of Maha Vishnu, that was dear to Baba, is chanted. This is followed by offering of dhoopam (incense), deepam (lamp) and maha neivedyam (food) and water. The second phase concludes with a 2 minute aarti invoking his blessings for the devotees. The noon aarti for Baba starts when the sun is at high point after offering of dhoopam (incense), deepam (lamp) and maha naivedyam (food) and water. Again, compositions by intimate Bhaktas of Baba are rendered. The aarti concludes with offering the same to devotees. Dhoop aarti for Baba is done at sunset after offering of dhoopam (incense), deepam (lamp) and maha neivedyam (food) and water. Again, compositions by intimate Bhaktas of Baba are rendered. One such composition talks about the greatness of Sadguru Sai Baba while offering humble salutations while another implores Baba to be with us always, no matter who forsakes us. The aarti concludes with offering the same to devotees. Shej Aarti is the final aarti of the day where we get Baba ready and comfortable for the night. Baba’s robes are changed around 8 PM and after offering of dhoopam (incense), deepam (lamp) and maha naivedyam (food) and water, the aarti is rendered. The aarti is offered to the devotees and the podium is cleared. The curtains are then closed to ensure no one disturbs Baba.